Guangzhou Evergrande Taobao are a football team based in Guangzhou that play in the Chinese Super League, the top tier of Chinese football. They play in the Tianhe Sports Centre Stadium with a capacity of around 60,000. The club was founded in 1954, and went on to win several second-tier titles before they became professional in 1993. They are also the only Chinese football club to win AFC Champions League twice, in 2013 and 2015. According to Forbes, Guangzhou Evergrande are the most valuable football team in China and this has been shown in recent years with their transfer activities (I’ll get into that later). The financial backing that they have had over the recent years is certainly seen in their trophy cabinet as they are currently the Chinese Super League champions, a title which they have held since 2014. The side is currently managed by former Real Madrid and Juventus defender Fabio Cannavaro, this is Cannavaro’s second spell in charge of the club after he was replaced by Luiz Felipe Scolari in 2015. Serbian midfielder Nemanja Gudelj is the highest paid player in your squad on £60k a week, remember I said I would talk about some of their immense signings? Well this is it. The former Ajax man has some impressive stats including 15 first touch and 17 work rate meaning he is more than well equipped defensively to handle the forwards in China. Ricardo Goulart is my other pick for a top player at the club. The attacking midfielder is certainly one of the better players in your squad and the 25 year old Brazilian should be able to dominate defences in the Chinese Super League. Despite having no youth caps for Brazil, Goulart has one cap for the First Team and I’m quite confident that this will increase in the future. Zeng Cheng is your best goalkeeper at the club, he has decent ability but to be honest he is not great. I have noticed that there are not too many decent Chinese keepers around so you may find it difficult to bring in a replacement. But if available I would definitely bring someone new in as a top quality keeper could be the difference between you securing the Chinese Super Title and failing to do so! Our first hot prospect in the Guangzhou ranks is Li Weijie. I would recommend that he should be used as your back up choice in goal until he improves enough to start in your side. The Chinese youngster currently has no youth caps for his country scoring but at just sixteen years of age he has plenty of time to change this. You’ll need to spend a lot of your time working on his poor jumping reach though. 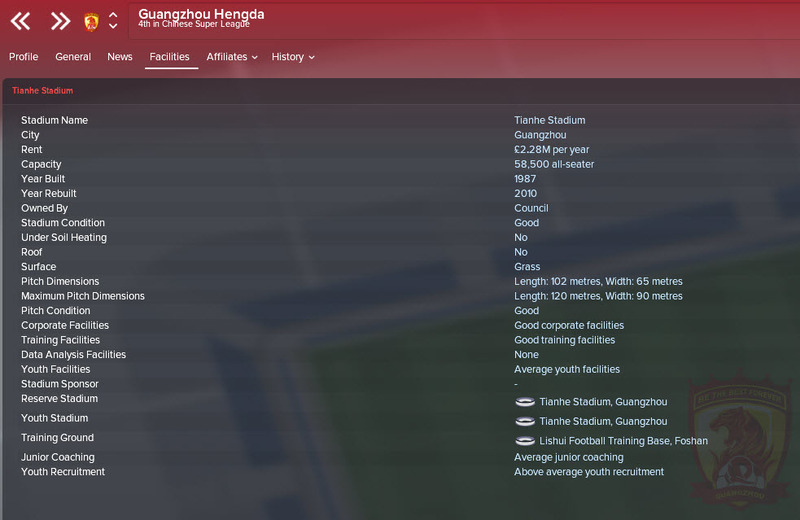 Our second hot prospect is a Chinese youngster who goes by the name of Tang Shi. Shi can play on either wing and if trained correctly could also be used as a striker. With some decent stats including 15 flair and 13 composure he should definitely be able to trouble the defences over in the Chinese Super League. As mentioned before Guangzhou Evergrande have rich finances with around £3 Million on the wage budget and around £9 Million in the transfer budget. This shows that there is still plenty of room to improve this already impressive Chinese side! 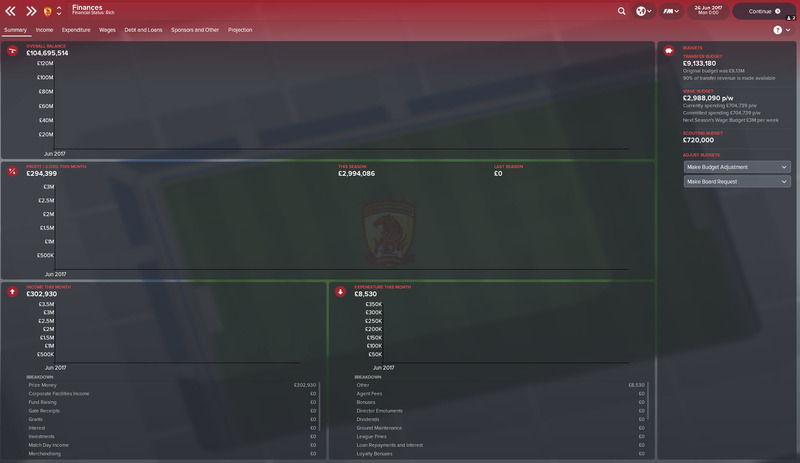 So good luck to everyone who manages Guangzhou Evergrande Taobao and I hope you have a fun time over in China, please let me know how you get on in your saves either in the comments by heading over to my Twitter @Casual_FM_. Thank you for taking the time to read this club guide! 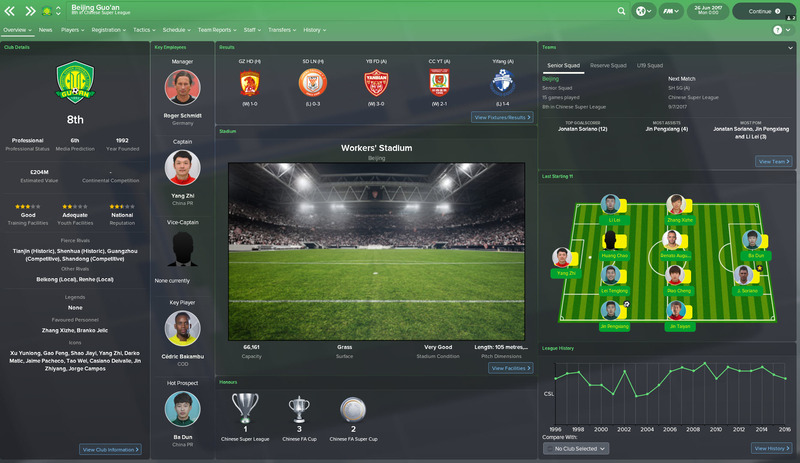 This entry was posted in FM Guides | Club Guides, FM18 Guides, Experiments & Wonderkids, Football Manager 2018 and tagged china, chinese super league, FM Guides, fm18, football manager, guangzhou. Bookmark the permalink.